Mary Sagittari owed her life to a disturbance at the Royal Court. Some seventeen hundred turns ago, the warlord in charge of managing Spacerock was desperate to be taken seriously. So he had petitioned for more units to be popped in his city. Some sides regard city management postings as a favor, a reward for a warlord's distinguished service. The Court of Jetstone used them as a mark of shame, for warlords it regarded as too dishonorable, incompetent, or disobedient to carry the Royal Radish into battle. Spacerock's city manager, Count Topotato, was regarded as a dullard and a problem. He was kept in the capital mainly to keep an eye on him, which unfortunately meant he was often present in the halls and chambers where serious business needed to be discussed. Worse, he had recently learned the procedure to introduce an item for formal consideration at Court, which was technically the right of any commander. After being denied time and again, Topotato grew fixated on having at least one of his proposals passed to King Slately and granted. So he proposed the idea of creating a 400-unit synchronized honor guard for the city, with a nightly display of torches, fireworks, a marching fife-and-drum corps, and culminating in a ceremonial fight of Orlies. This happened to be a turn on which Prince Tramennis was home from his diplomatic errands. While the rest of the Court sat in embarrassed silence, Tramennis stroked his chin in thought. "Don't you actually mean, 'flight of Orlies?'" he asked, searching Topotato's face. "You don't, do you..."
"No, fight!" yelled Topotato, slapping his fist into his palm. "Fight of Orlies! See, Highness, our two strongest Orlies fight each other in the air up by the tower, and then the loser becomes the feature dish of that night's feast! Hahaha!" Topotato's proposals had lost their amusement value to the Court some time before, but it was clear he was not going to give up until one of them passed. So Tramennis put on his negotiation face. He talked the proposal down, bit by bit, until all it involved was popping some more garrison units for the city's defense (units which were probably needed anyway). The motion passed, and it was granted by the King the next day. Unfortunately, this small victory only spurred Count Topotato on to more and wilder proposals and interruptions. In the end, he had to be traded away to Haggar for the price of two Clotheshorses and a tun of mead. Fifty turns after that, word arrived from Haggar that Topotato had croaked at sea, having jumped out of his corvette in an attempt to lead a stack of Aquabats in underwater combat. Reportedly, his last words were, "Topotato, and beyond!" Haggar provided these details to the Court of Jetstone in a written appeal for a refund of their units and mead. Mary Sagittari knew nothing of this, of course. To be a garrison unit in the capital city of Jetstone placed you farther from the goings-on at Court than if you were a warlord twenty turns' ride away. She had popped on the outer walls as part of a stack of eight archers, all bearing the Sagittari CXIV stack name, all with the same level and function. Her sisters and brothers were called Carrie, Terry, Jerry, Perry, Harry, Gary, and Rudolfo. On the turn they popped, they received no training or instructions, but simply stood there until sunset. They held their bows, occasionally plucking the string to make sure it was still taut. They looked down on the city streets, but they were not even on the side of Spacerock which faced the main gate. They did talk a bit among themselves, but it was hard to find topics of conversation when you were merely hours old. They all agreed that Jetstone was mighty and good, and that if anything tried to attack this city, they wanted to be the first to shoot an arrow at it. "I even want to hit it!" insisted Rudolfo. "I want to hit it and crit it! And then level up!" Mary and the others looked at him oddly. "Well," said Gary, clearing his throat, "we all hope our volley hits a target. As for anyone's personal arrow striking a target, I'd say that's something for the Titans to decide." Most of them nodded, and Rudolfo seemed suitably abashed. At sunset, they went inside the nearest turret tower. They sat on wooden benches and received and ate hot rations of bacon and yams, with a large cabbage leaf. Down a staircase, they found bunks waiting. There were plenty enough for other soldiers, but nobody else was around. Mary lay on the bottom bunk, looking up at the dent that Carrie's body made in the rope and straw mattress above her. It was nice to have her brothers and sisters around. But nobody had greeted them today, to welcome them to service. To Jetstone. To life, even. She supposed they were just not that important. In the hundreds of turns that followed, nothing occurred to change that supposition. It was just a fact of life. They did eventually meet other infantry, and were spoken to occasionally by a warlord. They sometimes were ordered up to the tower, or to another part of the inner or outer walls. But there was no training, and nothing to do. The tiniest change in routine, the smallest difference among them, was magnified and discussed endlessly. Mary stood out a bit for her dark hair, which had a few strands of white in it. There were very few chances to see a mirror in the course of her day, but Carrie and Terry seemed to think Mary was showing off. They took to positioning themselves at the opposite end of the formation from her, whispering and laughing. One evening, Mary borrowed a sword from an infantryman and cut off most of her hair. Her distinctive white-streaked raven locks were restored at the start of the turn. She looked the same as always. But Carrie and Terry stopped noticing Mary's hair after that. The name of swordsman whose blade she had borrowed was "Dodge." He was a garrison unit as well. He told her that, as a stabber, he had an overpowering urge to stick things in people. Then he asked her to sneak away with him so he could stick something in her. Mary found that she wanted to. It would certainly have been a thing to do that wasn't the same as all the other things she did. But she told him no. She didn't want to give Carrie and Terry anything more to talk about. Which was funny, because the next night Dodge sneaked away with Terry, and she and Carrie never discussed it. When the war began to change, even the lowliest grunt could sense something going wrong. Losing Prince Ansom was a thing keenly felt by every unit in Jetstone's army. And although Ossomer was beloved and worshiped by all, the suspicion that he was trying to fill boots a size too large was inescapable. Events far beyond the imagination of Mary and her siblings were shaping the kingdom. Rumors popped up every turn, like a new kind of ration. There was even a sense that the war might come here to the capital. Only...each day was still the same. The same blue horizon. The same empty walls. The same seven other faces. Gary, the stern one who kept them in line. Harry the jokester, who was always undermining Gary. Rudolfo the quiet one, almost as quiet as Mary herself. He always watched the horizon. Mary thought he must be wondering something, but she never asked what it was. The days finally turned dramatic and exciting just before the Battle for Spacerock. Many, many more units occupied the streets of the capital. Mary and her siblings had never seen such a show of Jetstone's might. One morning, Rudolfo yelped and drew his bow. "Shapes! Out on the horizon!" he pointed. The shapes were blobs. Yellow blobs. All of them drew their bows, but a horn sounded from the tower, signalling "allied units arriving." The Queen of Faq and her megalogwiffs were the first non-Jetstone units they had ever seen. The shadows they cast over the tiny infantry units in the streets were terrifying. How much more power was there in the world? What did it mean that the battle was coming here? Mary didn't know. But she was desperately glad that the huge yellow monsters were on Jetstone's side. She still had some trouble sleeping at night, knowing they were flying up there above her. On the morning of the great battle, so many new things happened at once that Mary lost her grip on it all. First Ossomer fell. Tramennis took his place. Then enemy dwagons—oh, so many!—and Archons flew into the airspace right above them. Over the Atrium roof, the enemy stacked in dread formation against the smaller force from Faq. These were live targets. Mary could not believe what she was seeing. She had the urge to loose her arrows upon them all blindly, and would have, but their standing orders were to hold unless directly engaged. Whispers and rumors passed among the ranks. "That's more than enough force to take the tower." "King Slately can't leave the city, we're off turn!" "Good luck, everyone. I'm still glad I was a Jetstone." It seemed as if this day would be the end of everything. The city was largely empty of field units, and no reinforcements could arrive until Jetstone started turn. It was doom for the side. They would fall in battle, or become Gobwin Knob's prisoners. All that enemy power hovered in the sky, waiting to be loosed. Mary did not know what she was supposed to be thinking at a time like this. She ended up wondering why she had never wondered anything at all. Then a bright light flashed from the tower, and it was Jetstone's turn. In an hour or so, columns of victorious Jetstone units began marching through the city gates and down Mainway toward the Garrison. These soldiers and heavies had crushed the enemy's infantry on the road, said the rumor, and now they were returning to see to the rest. 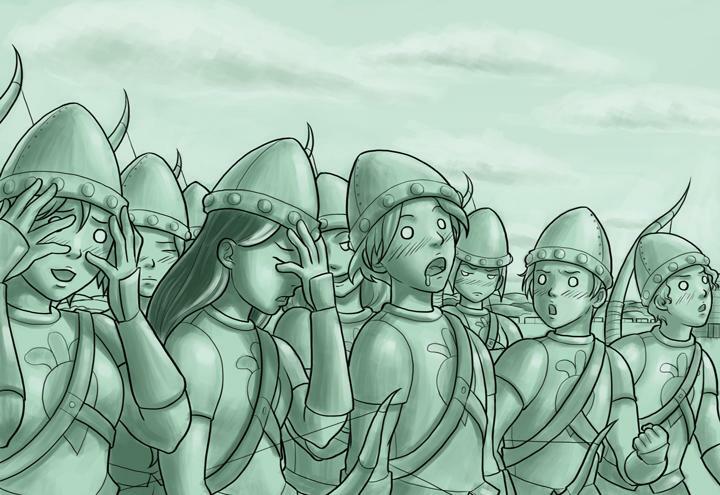 Large numbers of archer units—more than Mary knew the side even had—filled in among them on the walls. There were even a few warlords among them. The sudden comradeship and the jubilance of certain victory buoyed them all afternoon, until the enemy yellow dwagons began bombarding the Atrium. Mary did not understand why (or even how) they could do that, but the mood among the archers dimmed suddenly. The stacks stood and watched in a hush, as combat seemed to have started. But then, just as suddenly, some of the enemy dwagons began plummeting downward, and a loud cheer broke out. Mary shouted along, adding her "Huzzah!" to the chorus and feeling suddenly giddy. This was a victory that would be sung for ten thousand turns, and she was a witness! But...not a participant yet. Why had they not been ordered to shoot down the enemy? She squinted at the tower. Prince Ossomer had not yet fallen. Surely such a traitor should be worth a dozen volleys. She shrugged. That was not for her to decide, she well knew. A slight commotion seemed to be making its way around the wall toward Mary's stack: orders being barked, and heads turning. Before long, Mary could see a tall woman with flaxen hair, carrying a beautiful white longbow. An archery-capable warlord! She was giving instructions to each stack of archers. "Stack, harken!" snapped the warlady, when it was Mary's stack's turn. She and her siblings snapped more rigidly to attention. "I am Countess Artemis. These are your target priorities. Since you are low-level and unled, I want you volleying at the lowest-level Archons you can sight. Prioritize the ones with Leadership, then those with Foolamancy, then the rest. Stick to those targets, and leave the rest to higher-level and led stacks. If you see a led stack volleying, follow in turn. Otherwise, hold until ordered." Having spoken, the Countess then moved on to the next stack. But Mary stood there, awestruck. Her voice had been as smooth and strong as the limbs of a good bow. Her eyes...they were so fierce, so full of menace to Jetstone's enemies! What was that? How could there be such a person? "How could I be such a person?" she whispered, but loudly enough that Perry beside her could overhear. "She leads with a bow," said Mary, lost in thought. "She came to the Archers and prepared us for the fight. I...wish I were like that." Perry frowned. "I don't see why you'd say that," he said. "May as well say you want to fly around like an Archon." Bad things began to happen in the battle. Prince Tramennis was wounded. The tower shook, with King Slately still inside! The Countess disappeared into the fight, and Mary never saw her again. Above them, some of the enemy Archons raised their skirts up, waving their bits around and wiggling, to taunt and distract them. On Perry and some of the others, it certainly seemed to be working, but Mary just blushed. "No," she sighed softly, "I don't want to fly around like that." ^Count ToPotato A reference to the "I can count to potato!" meme. ^And Beyond A reference to the catchphrase of Buzz Lightyear from the Toy Story movies, "To Infinity, and beyond!" This page was last edited on 21 September 2015, at 07:32.